You are here: Home / How To / Why do you see error: snap “xyz” not found? Why do you see error: snap “xyz” not found? 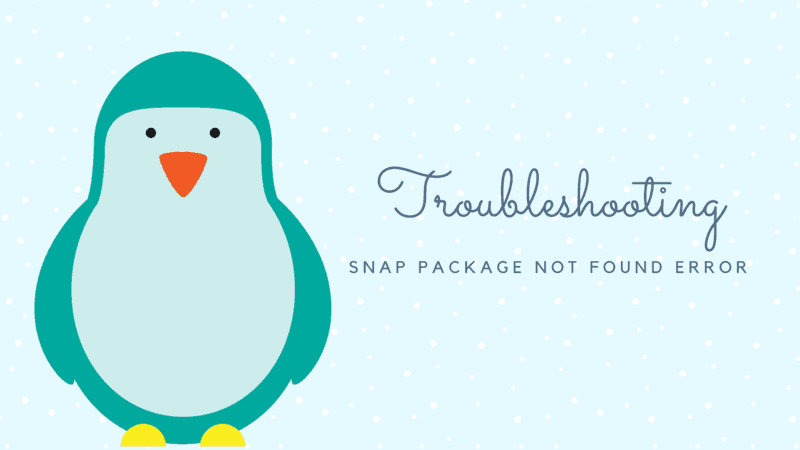 Brief: If you are encountering snap not found error for some Snap packages, this tutorial will help you find why. Snap is the new universal package system from Ubuntu that lets you easily and securely install software on all Linux distributions that support Snap. I recommend reading my other article to know more about Snap packages and how to use them. While Snap packages are an excellent new way of installing applications in Linux distributions, you may encounter a few error here and there. Once such error I covered previously is “snapd returned status code 400“. But recently one of It’s FOSS reader encountered another Snap error while trying to install VLC 3.0. You might encounter the same error with other applications like Spotify or Skype. Let’s try to troubleshoot it. Before you do anything else, please make sure that you have snapd installed on your system. You can install it using the standard package installation command of your Linux distribution. Once you have made sure that snapd is installed, let’s move forward. Try to see if your system actually finds the snap application in question. For example, if you are trying to install VLC using Snap and your system cannot find the application, try to list all the Snap packages available with ‘v’ or ‘vl’ etc. If the output doesn’t consist the application you were trying to install, it means that application is not available for your system. Hold on a second! What did I just say? Is it even possible? If it is not available for your system how can other people be able to install it? The answer lies in whether you are using a 32-bit or 64-bit operating system. You probably already know that support for 32-bit systems is fading. Newer applications are often developed only for 64-bit systems. If the Snap application in question is only available for 64-bit systems and you are using a 32-bit system, your Linux distribution won’t see the packages. Hence you see the package not found error while trying to install it with Snap command. In other words, you cannot install that application using Snap. Perhaps you can look for the regular way of installing that application if it is available in 32-bit format. It could happen that the application is listed in the output of the snap find command. But then what could be the problem in installing the package? This depends if the Snap package is available in classic. Snap packages by design are secure and they do not interact with the host system. Some applications need to use the host system and hence a ‘classic mode’ was introduced in Snap packaging. If the application is available in classic mode, you need to specify that snap needs to be installed in classic mode. This is done by using the –classic flag in the command. I hope this quick tip helped you to get rid of the common snap package not found error. Feel free to use the comment section below to provide your feedback. Snap is doomed to fail with it’s idiotic method of installing into /snap. Why would they not add a symlink to /bin? I’m not adding /snap to PATH, I’m uninstalling snap and staying away from this idiocracy. It is still in nascent stage. Hope it will get better over the time. Your advice is always helpful and very much appreciated. Not always. Main idea of Snap was to provide the sandboxing, isolating the host system. But not all applications work in that mode and hence the Classic mode.